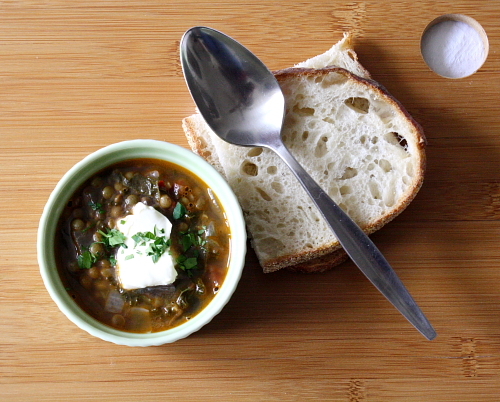 A couple weekends ago, the soup swap was brought back to life after a one-year hiatus. What were we thinking, skipping a year? I do not know. My only excuse is that we moved last January and at the time, I probably didn’t think the house was “ready” to have people over. I can’t say that it’s that much more ready now- we still have a long way to go and the list of home improvement projects is long- but fortunately I’ve forced myself to get over it and lower my standards; otherwise, I’d never have any guests! It’s a well-known fact that a little pork can enhance just about any soup, and we found it amusing that everyone’s soups, without specifically planning it that way, had pork in them. 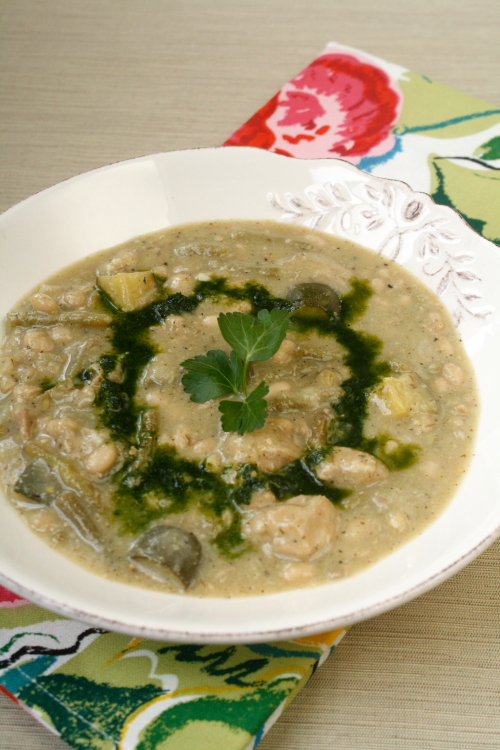 Michelle’s was the meatiest, a pork and tomatillo stew with big chunks of tender, falling-apart meat. Kate brought a delicious split pea with bacon, perked up with the addition of fresh rosemary. Molly made a hearty chickpea and sausage soup with some Hungarian sausage she’d been gifted from a neighbor, and Sarah made a fantastic wonton soup with homemade, pork-filled dumplings. 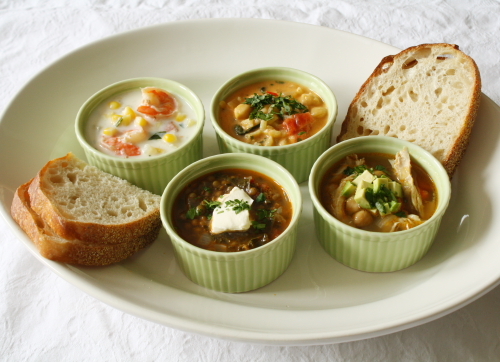 I was torn on what to make and, as before, prepared two soups- one to eat for lunch that day and one to take home. I had found a borscht recipe in Molly O’Neill’s One Big Table* that used slab bacon as the meat rather than beef, and I just happened to have some homemade un-smoked bacon in my freezer, so I made that as the soup to swap. For lunch, I created a soup that brought together elements of Eastern European peasant food (or at least, what I imagine it to be): sautéed cabbage, leeks and mushrooms in a light chicken and mushroom broth, with kasha (buckwheat) for an earthy flavor, and venison & pork meatballs. The final touch was some homemade yogurt stirred into each bowl for a little tang. It went perfectly with the homemade crusty rye bread Molly had brought. For dessert, I made a rustic apple tart- no recipe, just thawed out some graham cracker dough from the freezer, made a sort of custard from eggs and yogurt, sugar and cinnamon and poured it over sliced apples. Because of the yogurt, the custard didn’t have a perfectly smooth texture (the ladies said it reminded them of bread pudding), but that didn’t bother anyone. I kind of fell down on the job this year as compared to soup swaps past, where I photographed every soup and posted recipes for each one. I’m going with the excuse that I now live with a hungry male and the soups disappeared much faster than they did when it was just little ol’ me consuming them. Not only that, but ironically my schedule as a freelancer has, so far, left less time for blogging and photography than before! But as you can see, I did snap some photos of the borscht and will provide that recipe. I hadn’t made borscht in a few years but I had a pretty specific taste memory of what I wanted, so I used the recipe from One Big Table and tweaked it a bit, using the same ingredients but altering some quantities (more beets, less potato) and the cooking method (dirtying only one pot instead of two). I like my borscht to have a nice punchy sweet and sour flavor, so I added quite a bit more vinegar, and used my homemade red wine vinegar instead of the white vinegar called for. The only other change I’d suggest is cutting the carrots in something other than matchsticks, unless you have pro knife skills. It took me half an hour to cut 2 carrots! D’oh. Anyway, borscht recipe below, and here are links to the previous two soup swaps if you want to check out those recipes. And of course, I highly recommend hosting a soup swap of your own: you get a fridge full of soups and only have to do the work of making one, and all that time you save can be spent in a pleasant afternoon eating, chatting and sipping wine with girlfriends. Total no-brainer. *Incidentally, as of press time this great cookbook is on sale for 60% off- get it while you can! In a Dutch oven or other large, heavy pot, cover the pork with water by 2 inches, bring to a simmer, and cook for 20 minutes. Remove the pork and pour out the water. Return the pork to the pot with the beef broth, onion and bay leaves. Bring to a simmer and cook about 2 hours, until tender. Transfer the meat to a cutting board. When cool enough to handle separate the meat from the skin and fat, and chop into bite-sized pieces. Strain the cooking liquid and discard the solids; reserve the liquid. Heat the oil in the pot over medium heat. Sauté the beets and carrots until they begin to soften, about 10 minutes, adding the garlic after about 5 minutes. Raise the heat slightly and add the cabbage; cook, stirring frequently, until slightly wilted. Add the tomatoes, potatoes and reserved cooking liquid; bring to a simmer and cook until the potatoes are done to your liking. Add the meat, sugar and vinegar to the pot. Stir well and taste for salt and pepper, adding as needed, and add vinegar to taste– you’re aiming for a nice balance of sweetness and acidity. Beets and carrots are quite sweet, so I added much more vinegar than the original recipe called for (I used ¼ cup as opposed to 1 tablespoon), but taste and adjust based on your own preferences. 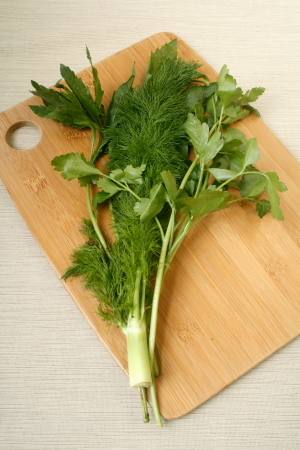 Serve with a spoonful of sour cream stirred in, and garnish with chopped herbs of your choice. Two winters ago, I wrote a series of blog posts all featuring ground venison, since I’d been given 6 pounds of it from my dad. According to my first post in the series, my plan was to write a different recipe for each of the 6 packages, but somehow I fell off after three. I can’t recall what I did with the other 3 pounds, but I’m guessing it’s pretty likely there was at least one batch of chili in there. Chili is probably the most common dish made with ground venison- I suspect some people turn to it because the powerful seasonings can mask the venison’s taste, but that hasn’t been a problem for us since my dad’s deer always taste great with no “off” or gamey flavors. 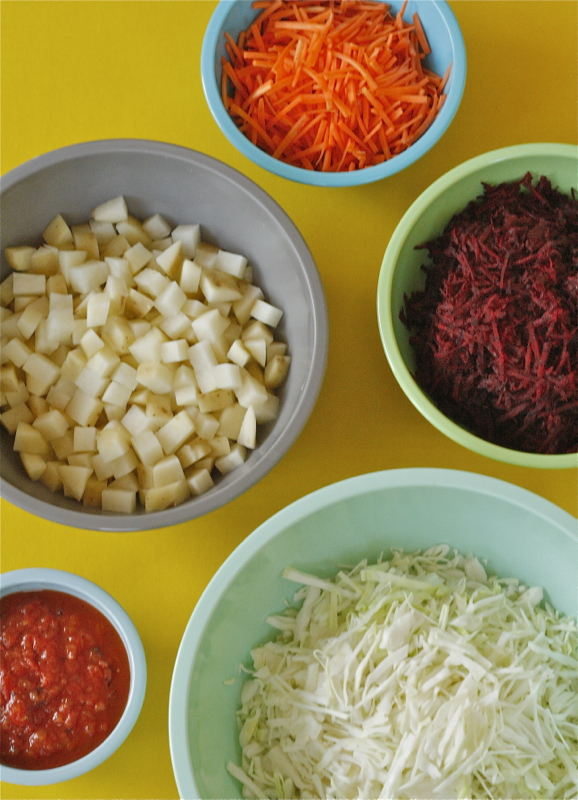 We just make it because it’s easy and we tend to have most of the ingredients on hand. However, I never really considered my usual chili (which consists primarily of chopping onions and garlic and opening a bunch of cans) to be worthy of writing down a recipe. Folks, this batch is a different story. I did rely on a couple canned ingredients, and this is still squarely in the camp of weeknight fare (even with the experimentation factor and my own slow-pokiness, it only took me an hour and a half from start to finish) but the flavors are richer, deeper and, dare I say, more sophisticated than your run-of-the-mill chili. Marvin may have to make good on his mention of taking up hunting himself in order to keep us stocked with sufficient quantities of venison, because rather than quell my cravings, this just made me hungry for more. When my venison supply was replenished a couple weeks ago, I knew that this was the first dish I wanted to try. My dad’s wife Amy had told me about a pumpkin chili she had recently made for a cook-off (it took second place out of 20- not too shabby!) and I was intrigued. Amy hadn’t used a recipe, but she told me what ingredients she used and I tweaked it to my tastes. For example, her version used chili powder, pumpkin pie spice and a little brown sugar, and included lots of beans, corn and tomatoes. I omitted the sugar, added toasted and soaked guajillo chiles instead of chili powder, and used cumin, allspice and cinnamon for a vaguely Middle Eastern feel. In fact, I can easily see substituting lamb for the venison in this recipe (or grass-fed beef if you’re not a fan of lamb). I also left out the corn and cut back on the beans and tomatoes, wanting the pumpkin, chiles and meat to be the primary flavors. For garnish, I stole Amy’s idea of reserving a little pumpkin to mix with sour cream, and added cilantro and scallions to brighten things up. Chopped jalapenos would be nice too if you wanted a little more kick. One authoritarian note, though- although I am generally very flexible with my recipes, I have to strongly advise against any temptations to use shredded cheese as a garnish- the flavors wouldn’t work with the cinnamon and allspice. I guarantee you won’t miss it, though. Note: 5 guajillo chiles will yield a chili that is “warm” but not spicy-hot; feel free to add more, but I wouldn’t go too hot because you’ll overpower the other spices. 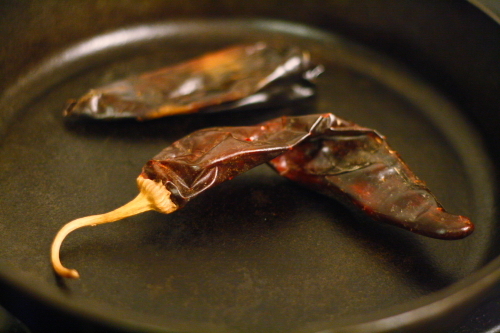 You could also substitute dried ancho chiles if guajillos are not to be found. 1. Heat a cast iron or other heavy skillet over medium heat. 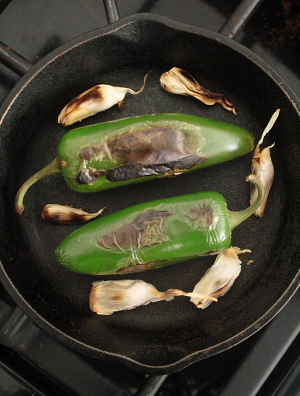 Toast the chiles in the dry skillet, turning frequently and taking care not to burn them. Remove the seeds and roughly tear the chiles into pieces; place in a blender. Pour over the 2 cups boiling water and replace the lid; allow to soak while you prep the vegetables. 2. Heat the oil in a Dutch oven or other heavy, lidded pot over medium heat. Add the onions and cook, stirring frequently, until they soften, about 5 minutes. Add the garlic and cook a minute more. 3. Increase the heat slightly and add the meat, salt, and all of the spices except the cocoa. Cook until the meat is browned- this will vary depending on your choice of meat; venison is very wet so it takes longer, but keep going until the liquid has evaporated. Meanwhile, process the chiles and water for 30 seconds in the blender. 4. Add the tomatoes, crushing them with your hands as you add them to the pot, and all but 1/3 cup of the pumpkin puree; add the cocoa powder and stir to incorporate. Strain the chile water into the pot with a fine mesh strainer or cheesecloth, pressing to extract all the liquid (guajillo skins are very tough; if you use ancho chiles you don’t need to strain them). Add more water to reach your desired consistency, allowing for some evaporation (I added about a cup). 5. Cover and reduce heat to a very low simmer; cook for 30 minutes, stirring occasionally and adding a splash of water if it looks too thick. About halfway through, add the black beans (canned beans often verge on overcooked, so I prefer to add them toward the end). 6. Taste the chili for salt and adjust as needed. Whisk the reserved pumpkin puree with a cup or so of sour cream. 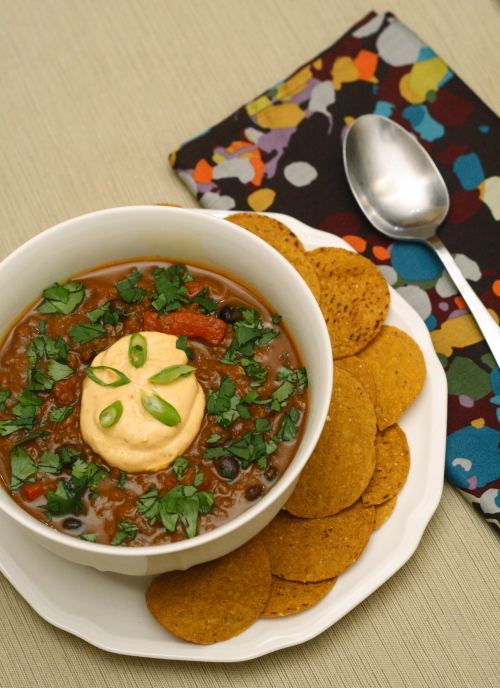 Serve the chili garnished with pumpkin sour cream, a generous sprinkling of cilantro and a few scallion slices. Everywhere I turn- on Facebook and Twitter and even *gasp* real-life conversations (remember those? 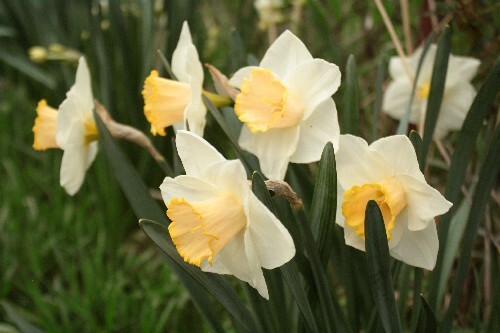 )- people are, to put it gently, lamenting spring’s tardy appearance this year. Don’t get me wrong, I’d love to ditch the scarf and gloves, and temps in the 60s would feel balmy right about now, but I try not to dwell on that which I cannot change. Instead, I’m trying to transition as best I can, by cooking foods which satisfy both the craving for something warm and hearty, and the desperate longing for something green. When I prepared my prosciutto leg in January, I had a fair amount of meat (and bone; see above) left over from the trimmings. I took some out of the freezer a couple weeks ago to make a Oaxacan pork stew. I’m sure the very word “stew” conjures rib-sticking, squarely winter food, but bear with me. The dish incorporates plenty of green things like tomatillos and squash and an herb purée that gives it a lively perk and, when stirred in, turns the color from olive-drab to a brilliant emerald. The stew’s heat (both temperature and spice-wise) will fend off these last bouts of winter chill, while the vegetables and herbs will prime your palate for green things to come. I served this one night to my friend Amanda, wh0 has visited Oaxaca with her Mexican beau, and she said it was very similar to something she had tried there. I wouldn’t expect anything less of a Rick Bayless recipe- this one comes from his book Rick Bayless’s Mexican Kitchen. The only change I made was to use zucchini in place of the chayote because the market was out of it that day, but I think it’s a fine (if less authentic) substitution. I also used frozen green beans because I prefer them over the somewhat large, tough specimens that are found in stores this time of year. If you still think that stew is too much of a winter dish, I would humbly remind you that in Mexico it is MUCH warmer than it is in most parts of North America, and they eat stews like this all the time! I won’t preach to you about not being deterred by the long ingredients list or prep time; this is unapologetically a recipe for those who may actually enjoy spending an afternoon in the kitchen. Might as well, since it’s still too cold to go outdoors. Place the meat and bones in a large Dutch oven or cazuela and cover with 3 quarts water. Bring to a boil, skimming the gray foam that rises to the surface. When no more foam surfaces, add the beans, minced garlic and onion. Partially cover and cook at a gentle simmer until the beans are cooked and the meat is tender, 1 ½- 2 hours. Add any water as needed during cooking to keep the beans and meat covered. 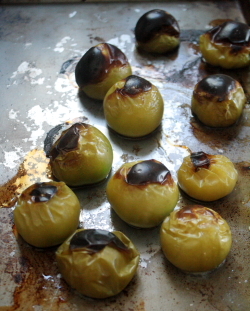 Meanwhile, roast the tomatillos on a baking sheet 4 inches below a very hot broiler until soft and blackened on one side, about 3-5 minutes; turn them over and blacken the other side. 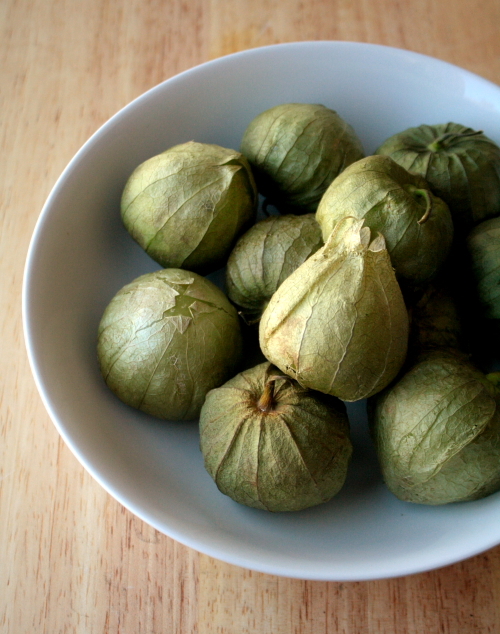 Transfer tomatillos along with any juices to a blender or food processor. Heat a cast iron skillet or heavy griddle over medium heat. 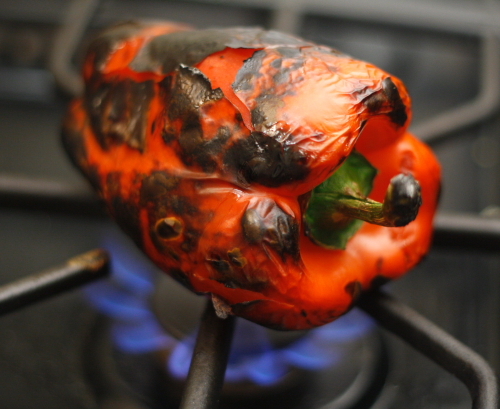 Roast the chiles and unpeeled garlic in the dry skillet, turning frequently, until soft and blackened in spots. (Note: I found it helpful to keep the garlic on the outer edge of the pan to avoid burning.) Peel the garlic and roughly chop it with the chiles. Add to blender along with the cumin, cloves and pepper, and purée until smooth. When the meat and beans are tender, pour them into a colander set over a large bowl or stockpot. 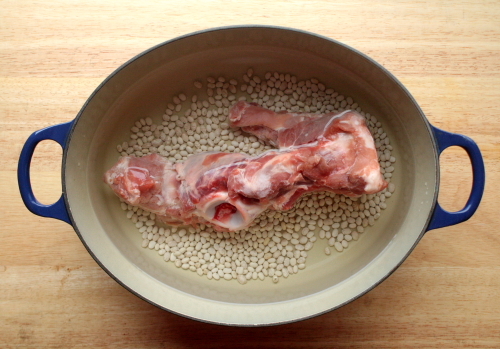 Remove the bones, picking them clean of any remaining meat and adding it back to the colander. Set colander aside. Skim the fat from the top of the broth. Wash and dry your Dutch oven or cazuela, set over medium heat, and add the lard or oil. When hot, add the tomatillo purée- it should sizzle sharply (test a drop first). Stir constantly for about 5 minutes to thicken. Add 4 cups of the pork broth, partially cover, and simmer over medium-low heat for 15 minutes, stirring regularly. Add the chayote or zucchini and green beans and cook 5 minutes longer. In a small bowl, whisk 2/3 cup broth with the masa mixture, mixing well to remove lumps, then whisk into the stew base until thickened. Return the meat and beans to the stew pot. Season with salt to taste, usually about 2 teaspoons. 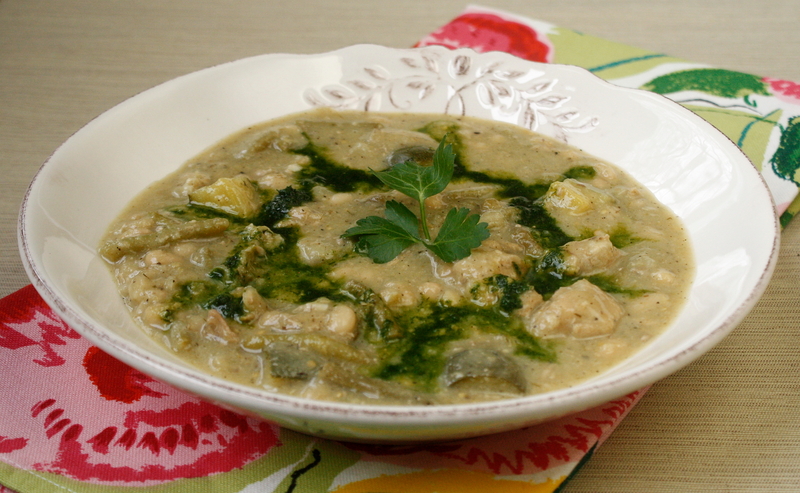 Let the stew simmer gently while you prepare the herb mixture. Purée the herbs with 1/3 cup broth in a blender until smooth. (If you are short of broth, you can use water.) Stir the puréed herbs into the stew. 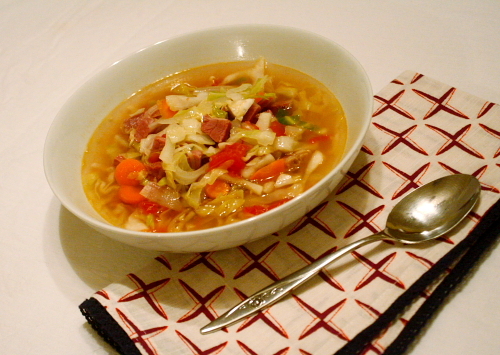 Add broth or water as needed to achieve a medium-thick consistency. 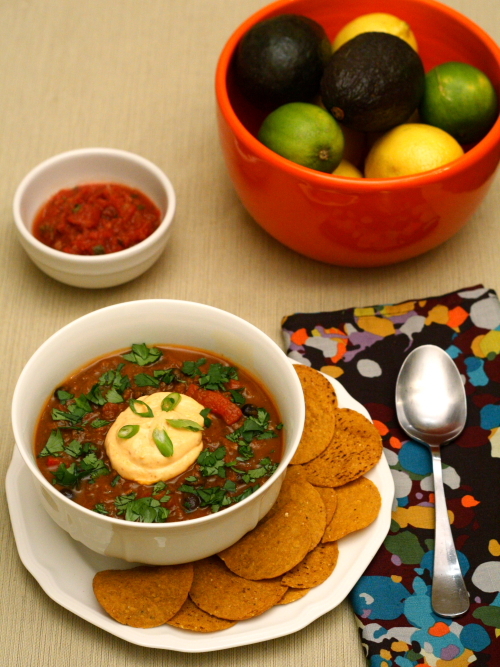 Ladle into wide soup bowls, garnish with additional parsley, and serve immediately with warm corn tortillas. 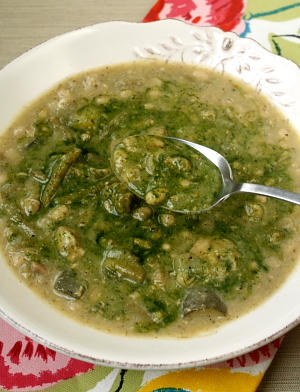 If not eating all of the stew immediately, stir a spoonful of herb mixture into each individual serving rather than the whole pot, reserving the remaining mixture to add to the stew when reheating it. This was probably one of the easiest challenges- not that I know what the others will be yet, but as far as curing and charcuterie goes, this was a snap- make up a simple brine (salt, pink salt, spices and water), brine the meat for 5 days, and then simmer with more spices until cooked. No humidity or temperatures to monitor; in fact the biggest challenge was probably finding room in the fridge for the container of meat and brine. I bought a brisket from Gratiot Central Market that was almost 8 pounds, the smallest they had. The recipe called for a 5-lb brisket, so I cut off the round (the thicker end) and stuck it in the freezer; I’ll probably do some kind of braise with it later. 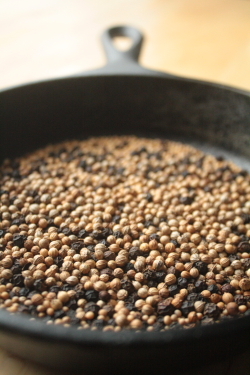 I made my own pickling spice according to the recipe in Charcuterie, which now has me wanting to pickle anything and everything just because I have a whole jar of it and it’s awfully pretty and intoxicating (photo shows coriander, peppercorns & mustard seed I toasted). But if you really want easy-breezy, it’s fine to use a pre-mixed pickling spice. 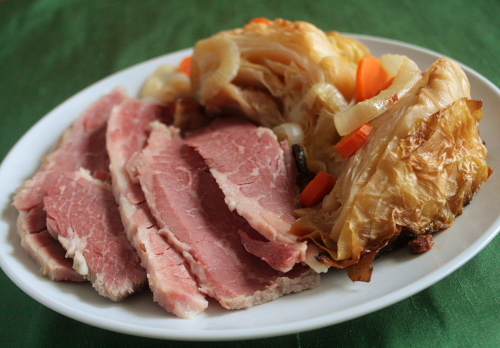 For our first corned beef meal, I made this braised cabbage instead of boiled. I just feel like it’s a little dressier, or maybe it’s just my comfort zone since I don’t make many boiled dinners. I used the corned beef cooking liquid instead of chicken broth for the braising liquid and it was fabuloso. The meal got big thumbs up from Marvin, who called the corned beef “sprightly” from the coriander and praised the cabbage’s sweetness. He was still carrying on about it the next day, saying it was the best corned beef he’s ever had. So there you have it- homemade really does make a difference! 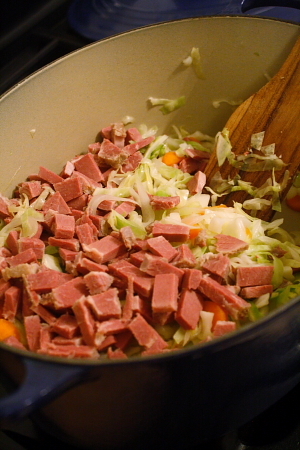 Once we got down to about a pound of corned beef left, I decided to make a batch of corned beef and cabbage soup, loosely based on one at a restaurant where I used to work. Now, I know there are probably a thousand recipes out there for this soup, and I make no claims to any sort of originality or authenticity with this, but for you other Charcutepaloozers out there, this is a solid recipe and a good way to use up leftover stock and meat. It incorporates the highly flavorful cooking liquid from simmering the beef (waste not, want not!) and is ridiculously easy to throw together. In other (sort of related) news: My latest SimmerD column is out; it’s a profile of P.J.’s Lager House in Corktown and you can read it here. Notes: If you didn’t cook your own corned beef, you could try making this with deli corned beef- for the cooking liquid, use beef broth, and put a tablespoon of pickling spice in a tea strainer or cloth spice bag to cook with the soup. I didn’t use a potato since I’m off the white starch for the moment, but I probably would have otherwise. I didn’t miss it though. Your call. Directions: Heat a couple tablespoons of olive oil over medium heat in a Dutch oven or other large, heavy-bottomed pot. Sauté the onions and carrots until the onions are softened and translucent, about 10 minutes. Raise the heat slightly and add the cabbage. 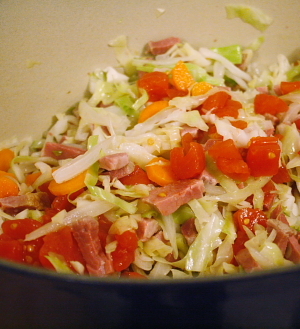 Continue to sauté until the cabbage is wilted and softened, about 15 minutes, adding more oil if needed so nothing sticks. Add the tomatoes, broth, meat and potato, if using. 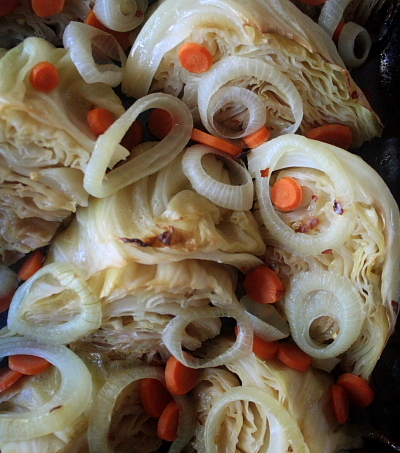 Simmer until cabbage and carrots are cooked to your liking. Stir in the sauerkraut and taste to check the balance of flavors, adding more salt, water (if too salty), sauerkraut juice etc. as needed. Serve with hunks of pumpernickel or rye bread and butter. “Why I hate cookbooks” may seem like an odd blog post title for someone who owns as many cookbooks as I do, and who regularly swoons over them. But every so often, I have one of those frustrating cooking experiences that make me almost angry at the cookbook author for whatever flaw in their recipe that caused the demise of my dinner. The primary problem with cookbooks is obviously that they’re not interactive. Have a question or need something clarified? You’re outta luck. * Unlike blogs, where you can usually get a question on a recipe answered via the comments or an email, cookbooks are static and unyielding, leaving many home cooks up in the air and having to guess at what was intended. Another pet peeve is cookbook authors who don’t seem to test their recipes with American ingredients, even though the U. S. is the primary market for their book sales (they should take a page from Julia Child- she specifically tested her French recipes in an American kitchen with American ingredients, to make sure they would work). I frequently encounter this problem when cooking from ethnic cookbooks whose authors live abroad. There are big differences in ingredients such as flour or even meat, and adjustments need to be made. The person executing the recipe should not be expected to know to make these modifications. So, what prompted this bout of cookbook disaffection? Spending an entire afternoon and evening in the kitchen one Sunday, and having two different dishes not turn out as expected. The dishes attempted were pork rillettes (from Charcuterie ) and a baked chicken and freekeh dish (from the The New Book of Middle Eastern Food ). 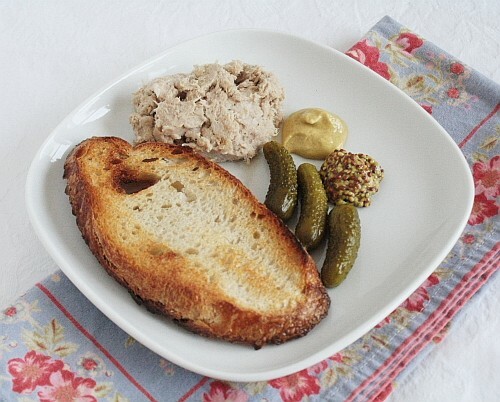 The rillettes, made with expensive pastured pork, turned out the consistency of chewed tuna fish. Note to self: next time, do NOT use the stand mixer as suggested in the book! Next time I’ll use a fork to gently break apart the meat. Another issue was that there was not even a ballpark indication of how much liquid to add, and I think I added too much, which also contributed to the “wet tuna” consistency. pork that reminds you of tuna is just… wrong. The baked chicken dish was rescued but turned into something completely different from what was intended. I thought the instructions were a little wonky- boil the chicken for an hour, then cut it up and bake it for 30 minutes- but forged ahead, trusting the recipe. After 1 hour of simmering, however, my chicken was falling apart and unable to be cut up into pieces. What would the additional 30 minutes of baking have done anyway, besides drying out the meat?! Bizarre. (Incidentally, this is not the first time I’ve had an issue with a recipe from this book.) I ended up picking all of the meat from the carcass, putting it back in the broth with the freekeh, and just calling it soup. It tasted fine in the end, but what if I hadn’t been experienced enough to shift gears and transform the dish into something else? I’ll never fully turn away from cookbooks, but right now, I’m more than a little disenchanted. My resources (both time and money-wise) are limited, and I can’t afford to devote them to recipes that can’t deliver a reliable result. 6/4/10 UPDATE: I had houseguests from France to whom I hesitantly served the rillettes, explaining that it was my first effort, etc. 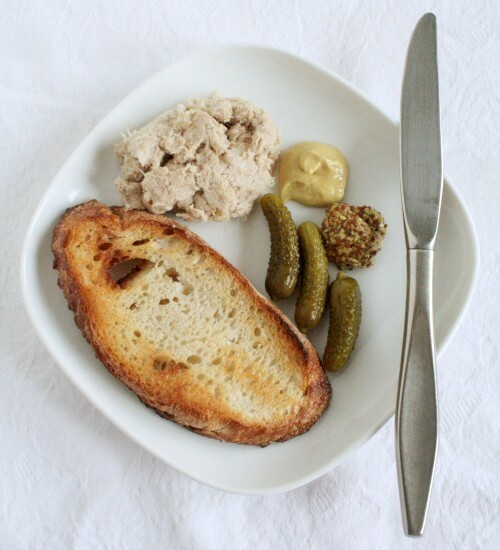 They both said that the rillettes were “tout à fait correct” (i.e. just fine), and judging by the quantity they consumed, I don’t think they were just being polite! They said rillettes can range from fine to coarse. I still think I’ll hand-mix them next time, but it was good to know they weren’t the failure I thought they were. I do think a few weeks in the fridge improved the flavor & texture. *A couple notable exceptions are Rick Bayless and Paula Wolfert, both of whom are great about answering questions via Twitter! Last year I had the rather brilliant (if I do say so myself) idea to host a soup swap for myself and some girlfriends. 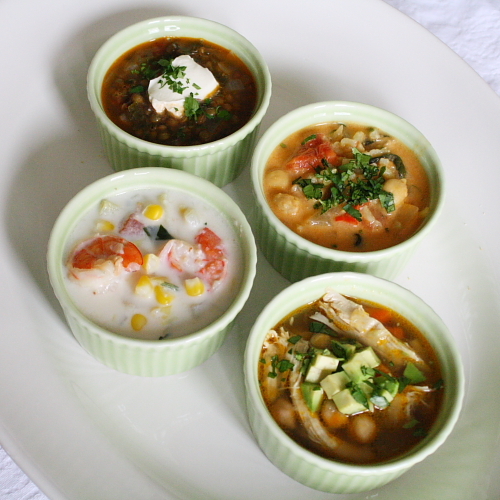 The concept was simple: do the work of cooking one soup, but wind up with a fridge full of 4 or 5 different soups. This was mostly born from the fact that while I love to cook big batches of things to take in my lunch for the week, I don’t exactly want to eat the same thing 5 days in a row. So, in what I hope will become an annual tradition, we got together and traded soups (and stories of youthful indiscretions, but that’s for another blog… or not!). 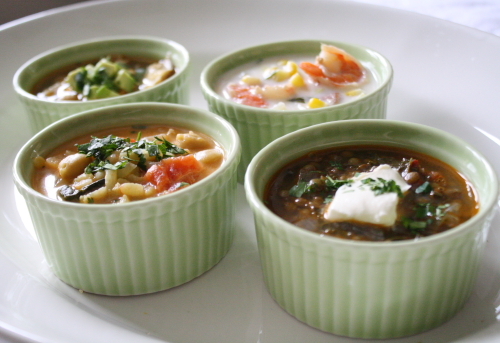 This year’s batch of soups were no less delicious and satisfying than last year’s. So without further ado, here are my “tasting notes”. For the recipes, just follow the links. First of all, the “French” refers to the type of lentils used, not the style of the soup, so don’t worry- it’s not some heavy-cream-and-butter bomb! French green (Puy) lentils are so great in soup; they are much firmer than regular brown lentils and have a nice chew to them. 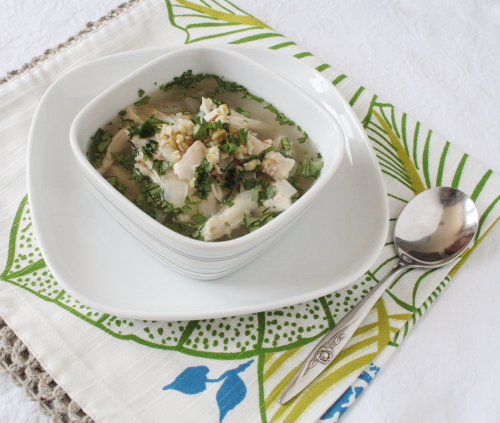 This soup is seasoned with mint and cinnamon, among other things, which gives it a delightful Middle Eastern feel. There is an optional garnish of thick Greek yogurt. I would up the suggested salt content a tiny bit, but other than that I found it to be just right as-is. Oh, and there are greens in it too so it’s super healthy. Thanks Kate, this is definitely going into the rotation! The soup for those who like to eat alliteratively! Amanda says she makes this for weeknight suppers on a pretty regular basis, and it seems pretty straightforward and simple. The only thing that might throw you off is finding fresh epazote, but I believe she made this batch without and it was still delicious. I tend to prefer dark meat so I would probably sub out an equal weight of bone-in, skinned chicken leg quarters, but that’s just a personal preference and it was certainly good (and probably a bit healthier) with the breast meat. Although it’s not in the recipe, I couldn’t resist adding some chopped cilantro when I reheated mine. 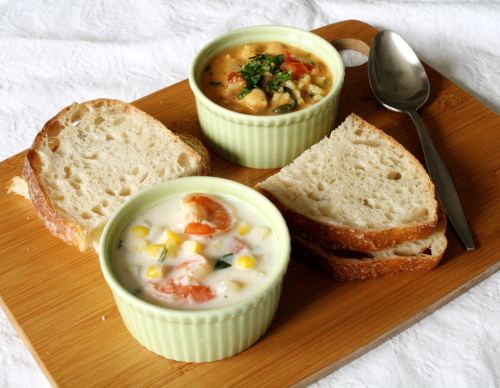 Shrimp, corn, fennel, bacon… what’s not to like about this soup? Some of the commenters on the Real Simple site (where this was taken from) were pretty harsh, saying it was very bland. I could definitely picture a dash or two of Tabasco, and just a wee bit more salt, but it was far from being as bland as they implied! (You’re probably starting to think I’m a salt freak at this point, but a pinch of salt can be the difference between bland and just right. Taste and add as you go… everyone’s taste buds are different!) Michelle made this with the suggested (optional) bacon and I would too, but I would maybe crumble it in just before serving. The only other tweak I would consider is adding a bit of cornstarch to give it a thicker, more “chowdery” feel (dissolve cornstarch in cold water before adding to the soup). 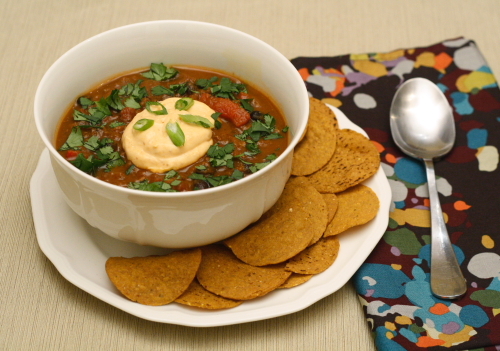 This vegan soup was delightful and looks really easy to make. The rice is listed as “optional” but I would definitely include it- not only does it make it a bit more filling, but it’s beneficial to eat rice and legumes together, especially for non-meat eaters. Sarah added some spinach at the end of the cooking (not in the recipe) and it was a nice touch. Thanks again, ladies… Can’t wait for our next swap! I’m getting to this point in my cooking career where I’ve begun to actually create my own recipes based on techniques I’ve learned from cookbooks. Don’t get me wrong, it’s a great feeling to make a recipe from a cookbook and have it turn out just right (especially if it’s something you’ve never attempted), but it’s a different level of satisfaction to conceive a recipe and have it turn out perfectly the first time. This is so exciting to me- kind of like when I first started writing songs after just playing other people’s for years. I’ve never had much problem making up recipes for simple things like soup, pasta, salad or salad dressing. But this past year I’ve been branching out and creating slightly more advanced recipes based on ideas I have for flavor combinations. One of the first times I did this was for these scrambled eggs with scallops & bacon (which, incidentally, would be a fabulous Valentine’s breakfast!). I did refer to another recipe, kind of like a musician refers to certain chord progressions to write a pop song, but the cool thing for me was that I thought up the idea independently and that it worked! Since then, I’ve written other recipes, each time getting a little more confident and feeling less like I need to consult a cookbook. Some are very simple, like this saffron-citrus risotto or this Chinese-style kale (probably my most popular recipe), while others, like this venison & porcini ragu, are a little more involved. Last weekend I got together with some girlfriends for Soup Swap Mach II (you can go here to check out last year’s Soup Swap) and after flipping through tons of cookbooks for soup recipes, decided to just make one up. The flavors for this soup were inspired by an onion tart I made last year from the Chocolate & Zucchini cookbook which contained onions, cheese, and the somewhat unexpected element (for French cuisine, anyway) of cumin. I really loved these flavors together and thought they’d be wonderful in a soup. The depth and intensity of this soup was unlike any cheese soup I’ve ever had- I caramelized the onions for almost an hour until they reached a deep amber color, toasted the cumin seeds, and used a pound of cheese. 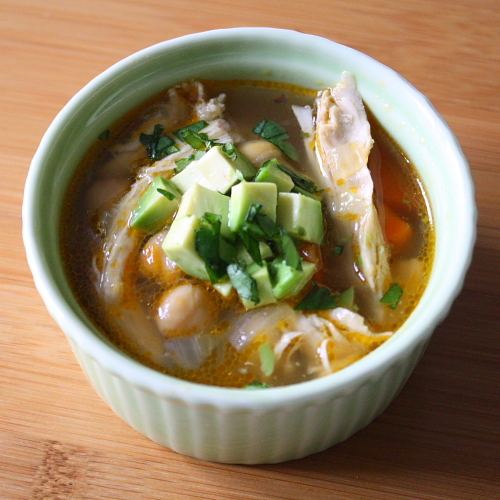 Decadent, perhaps a bit, but this soup reaches a level of savory that makes it all worthwhile. Don’t be put off by its somewhat drab appearance- what it lacks in looks, it more than makes up for in taste. 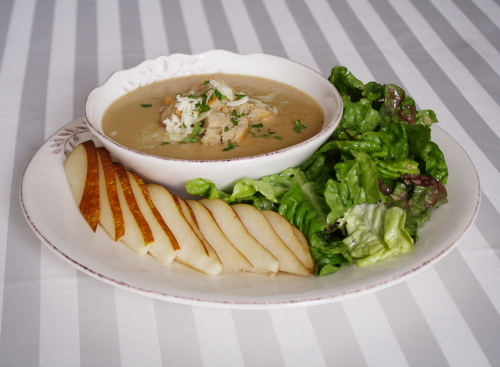 Serve it with a salad, some fruit (apples or pears would be good) and crusty bread or croutons. Notes: If you’d like detailed instructions on caramelizing onions, I used the techniques described in this post, using wine to deglaze the pan instead of water. For the cheese, you can use whatever you like- Cheddar, Monterey Jack, Emmenthaler or another hard cheese like Comte… Just make sure whatever you choose is not going to have a funky flavor once melted, as some Swiss-style cheeses are prone to do. I used a mixture of 3/4 Wisconsin white Cheddar and 1/4 Emmenthaler (because I had some in the fridge to use up) but I think you could play with the proportions or try other cheeses. I wouldn’t use anything too strong or too mild unless you plan to mix two cheeses. The Emmenthaler on its own would be lovely, but it’s a bit spendy; the Cheddar is much more affordable. Directions: Melt 2 Tbs of the butter over medium-high heat in a heavy-bottomed skillet or Dutch oven. Whatever you choose, make sure it has a light-colored bottom so you can monitor the browning process. Most importantly, do NOT use a non-stick pan! When the butter has melted and the pan is hot, add the onions. Sprinkle them generously with salt- this will help to draw out the water, which is the first step to getting them browned. Stir often with a wooden spoon or spatula. Be patient- the caramelization process will take quite a long time (45 minutes to an hour), but it’s not difficult and the flavor is so worth it! Some cooks like to read while they stir… The hotter you keep the heat, the faster things will go, but the more you’ll have to be vigilant with your stirring. Towards the end, you may have to reduce the heat a little to keep things from scorching. 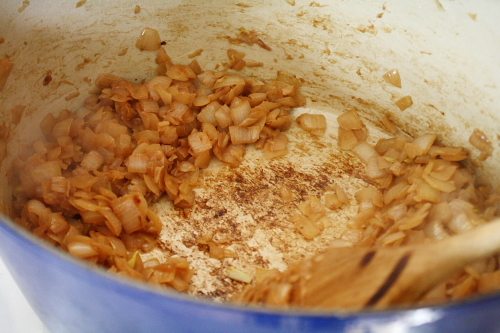 After the water has started to cook out, the onions will become a pale brown and an amber-colored residue will gradually begin to build up on the bottom of the pan. When you can no longer scrape the browned part up with your spoon alone, start using the wine to deglaze the pan. 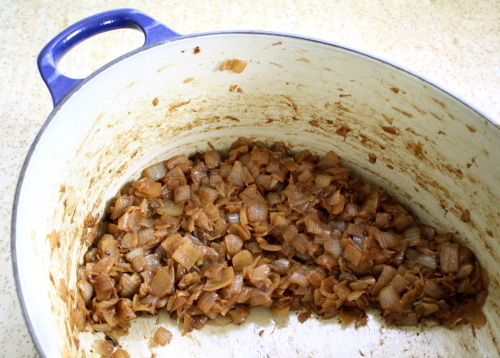 To start off, you’ll want to deglaze every 45-60 seconds or so; as the onions cook, the intervals will become shorter. Every time a “crust” accumulates, add a SMALL splash of the wine (no more than a tablespoon; less if possible) and stir and scrape the pan to incorporate the browned bits into the onions. The sugars from the wine will assist the browning process and give you a gorgeous deep amber color. Onions, about 3/4 of the way done. Note the brown "crust" on the bottom of the pan. Finished onions- 6 cups reduced to about a cup and a half! When you’ve used up all the wine and the onions have become quite dark (see photos), reduce the heat to medium and add the remaining 1 Tbs butter to the pot. When the butter has melted, sprinkle the flour over the onions 1 Tbs at a time, stirring to incorporate and making sure there are no lumps. Cook the floured onions for 2-3 minutes so that the flour loses its “raw” taste. Increase the heat back to medium high, add the chicken stock, and bring to a low simmer; the soup will thicken slightly. Add the milk; when the soup comes back up to temperature, add the cheese. If you like, you can reserve a little of the cheese for garnish. Stir gently until the cheese has melted. Cover the soup and reduce the heat to low. Toast the cumin seeds in a small dry skillet over medium-low heat until they are fragrant, being very careful not to burn them. (If they seem at all burned, toss them out and start over; burnt cumin is very bitter and will ruin your soup!) When they have cooled, crush them a bit in a mortar & pestle to release their flavor. 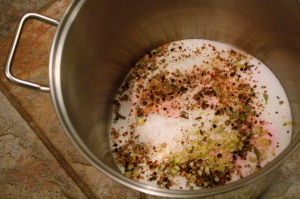 Add the cumin to the soup along with the white pepper. Taste for salt, but it likely won’t need any. If you want to leave your soup as-is, you’re done. 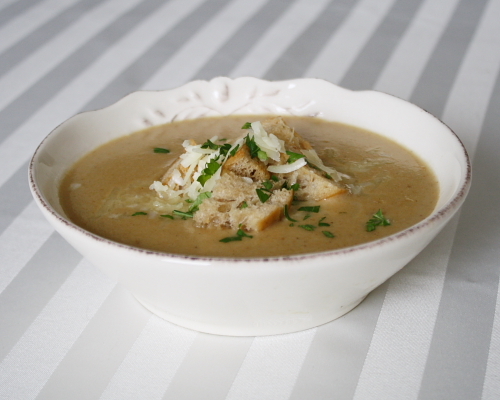 If you want a smooth soup, transfer to a blender in 2 batches and puree until very smooth. Alternately (and I think I’d do this next time), puree half the soup and stir it back in- this will give you some body, but you’ll retain the texture of some of the onions. Ladle into bowls and top with croutons, a little chopped parsley, and a pinch of grated cheese if desired.